In the opening narration of this landmark 1961 documentary, the filmmakers proclaim their interest in presenting the “cinematic truth” of the situations they’re exploring. That phrase, of course, is cinéma vérité in French, and Chronicle of a Summer is often referred to as one of the first verité features. The film is in fact nothing like the “fly on the wall” documentaries that came to represent the verité documentary style in both England the U.S. 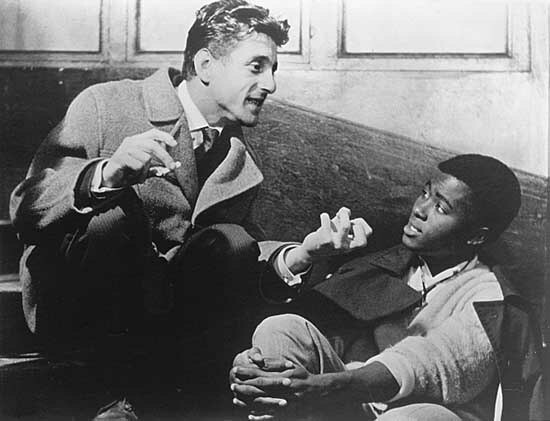 The film is as much a chronicle of Jean Rouch and Edgar Morin assembling the film as it is an exploration of the mindset of Paris in the summer of 1960. The interviews contained in the invaluable onscreen supplements and the booklet that comes with the package clarify the slightly schizophrenic nature of the project. For instance, the film begins with two young women conducting “vox pop” (man on the street) interviews throughout Paris, asking simple but decidedly existential questions (“How do you live?” “Are you happy?”). The majority of the film, however, is taken up with indoor interviews about work and love with individuals who “overshare” with sociologist Morin — two women to the point of tears. The film’s third act finds the indoor interview subjects taking a vacation to Saint-Tropez, at which point the film’s tone changes from grim to carefree. The key sequence comes at the end, when we see the participants voicing their opinions of a rough cut of the film at a preliminary screening. A few accuse the others of having “acted” their breakdowns and the words “boring” and “phony” are thrown around. At this point, Rouch and Morin have an onscreen discussion about whether their experiment has succeeded or failed. Today’s reality shows are littered with moments in which the participants badmouth each other or we watch someone having a breakdown, unsure if their emotions are real or “heightened” by the presence of a camera. In Chronicle we are confronted with those moments, but are also forced to consider them objectively — this is a product of the tension that exists between Morin’s approach to the material (political, psychoanalytic — he is the inquisitor in the breakdown sequences) and Rouch’s (anthropological, stylish — he conceived of the Saint-Tropez getaway). Morin summarizes the contrast very clearly to one interview subject, maintaining that “Rouch thinks life is fun” and he does not. In the supplements we learn a good deal about their respective methods and the ways in which Morin concentrated wholly on content (read: emotion), while Rouch worked very hard to make the film a vibrant visual experience, thereby ensuring Chronicle became an influence on documentary filmmakers for generations to come. Along these lines, the film’s most interesting, and often imitated, scenes find the camera following closely behind a person as he or she walks through the streets of Paris. The single most memorable instance of this has interview subject Marceline Loridan summoning up memories of her time in a concentration camp as she takes a determined stroll. The print essay by scholar Sam Di Iorio and onscreen interview with anthropologist Faye Ginsburg discuss how revolutionary these sequences were, as they were shot using a specially designed handheld camera that clearly recorded ambient sound. Vintage TV interviews with Rouch and Loridan include reflections on the film’s production and its relation to the then-burgeoning New Wave movement. The full-length documentary Un été + 50 by Florence Dauman (Hollywood Mavericks) offers lengthy sequences cut from the film as well as present-day interviews with Morin and some of the interview subjects. One can readily understand why most of the sequences in the docu hit the cutting room floor, but one outtake does situate interview subject “Mary Lou” as a secretary at Cahiers du Cinema. In the discarded sequence, she debates the merits of Antonioni’s L’Avventura with her then-boyfriend, an uncredited Jacques Rivette.